Prayer and charity define Lenten traditions at Cardinal Gibbons and help us prepare for Easter. Those traditions include quiet reflection, and a Stations of the Cross Prayer Service. Inspiring 256 student dancers to share their gifts and talents with audiences for a two-hour concert on four consecutive days takes dedication, commitment, and leadership. On a recent Saturday morning, a group of Gibbons Alumni converged on a Habitat for Humanity building site in Raleigh. They came to serve, support one another, and give back to their alma mater. Are you ready to gain real-world experience? Are you looking for an internship, part-time, or seasonal employment opportunities? If so, start your search using the newly-created iCube job board! Assistant Principal of Instruction Nancy Barkan has been appointed Interim Principal of Cardinal Gibbons High School for the 2019-2020 academic year. She will assume her new role on July 1. We continue our Educator Spotlight series, which offers a glimpse of how Gibbons educators care for and engage students. Today, we spotlight Science Educator and Alumna Sarah Kuszaj '95. Just as Gibbons students are involved in outreach opportunities, so are Gibbons parents, who are working together to serve and give back to our surrounding community. In a word, Gibbons Drama’s production of “Hairspray” is phenomenal. It is, however, phenomenal on many different levels. We continue our Educator Spotlight series, which regularly brings readers inside the classroom of one of our educators. Today, we spotlight Technology Educator Jon Armfield. What began a decade ago as a one-day career fair evolved this year into a week of events to prepare students for college and the work world, culminating in Career Expo and Internship Alley. Industrial design at its best.That is the description of the award the Cardinal Gibbons Robotics Team won at the recent North Carolina FIRST Tech Challenge State Competition. For four Wednesday evenings, parents will be taken on a contemplative and scholarly journey through the season of Lent, ed by Director of Outreach Ministry Gary Meyerl '82 and Theology Educator Patrick Dmytriw. Beautiful. Splendid. Lovely. These are just a few of the words used to describe the new stations of the cross, which now stand vigil in the school's Prayer Garden. Everywhere you looked during the athletics leadership conference there were student-athletes and coaches engaging with one another and discussing one topic - the athletics culture code. Gibbons students, educators, alumni, parents, and parents of alumni joined together recently to serve the less fortunate at the Shepherd’s Table Soup Kitchen in Raleigh. Gibbons Alumni have enduring memories of their retreat experience - from discovering insights about themselves to growing closer to God. They also recall how the experience impacted their futures. Three countries, eight cities, ten days, one amazing journey. That is what 35 students and five educators experienced during their recent school-sponsored trip to Western Europe. The recent Parent and Educator Leadership Conference, a Cardinal Gibbons first, was an innovative way to celebrate and promote a vibrant campus life. While some student teams spend months practicing for a sport, others do the same for a science competition. All that practice recently paid off for our Science Olympiad teams. I am writing to inform you that 2018-2019 will be my last school year at Cardinal Gibbons. It may still be winter, but it is time to start thinking about summer camp. From academics and athletics to the performing arts, Gibbons Summer Programs has something to offer every camper. Twenty-nine visual arts and media students captured 58 awards in the Regional Scholastic Art Awards Competition. Cardinal Gibbons celebrates the 2019 Athletics Hall of Fame inductees: Jessica Botzum Cockrill ’04, Kaela Pearce ’04, Serena White ’04, and Jonathan Burns ’08. Our stories this week focus on members of our community and why they joined the Gibbons family. We end the week by spotlighting Gibbons Student Gloria Lima '20. Our stories this week focus on members of our community and why they joined the Gibbons family. Today we spotlight Gibbons Alumna & Educator Lauren Gentile '04. Our stories this week focus on members of our community and why they joined the Gibbons family. Today we spotlight Gibbons Coach and Educator Gordon Galloway. Our stories this week focus on members of our community and why they joined the Gibbons family. Today we spotlight Gibbons Parent Mark Cadiz. Our stories this week spotlight members of our school community and why they joined the Gibbons family. We start with Music Educator Mark Cashin. Every winter for the last 20 plus years the Cardinal Gibbons student council has sponsored a blood drive for the school community. This tradition of service continued today. We continue our Educator Spotlight series, which regularly brings readers inside the classroom of one of our educators. Today, we spotlight Drama Educator Kevin Ferguson. It is fun, exciting, and engaging. It is a preview of the Gibbons experience for prospective students and their parents.It is the Gibbons Positioning System (GPS) program. Achieving a greater appreciation and a deeper understanding of the Mass is a goal of the latest Parent Faith Reflection Series being offered through the Gibbons Theology Department. Aspiring student engineers are building a replica of NASA's Mars Rover and, at the same time, having fun, involving the entire school community, and establishing a legacy. Prayer, service, giving back, and sharing joy… All are traditions at Gibbons, especially during Advent when students, educators, and parents come together in celebration of Christ's birth at Christmas. 'Tis the season for all things Christmas, including wintry weather and the sounds of holiday music filling the halls and theaters at Gibbons. There even is a visit scheduled from Santa! We continue our Educator Spotlight series, which regularly brings readers inside the classroom of one of our educators. Today, we spotlight Social Studies Educator Jessica Lowe '99. During a Gibbons retreat, educators and students eat, play, and pray together, as well as grow in their love for God and for one another. By the end of the retreat, they also experience a transformation. A panel of medical professionals advised students about different careers in the medical field during the second installment of the Illuminate Your Future (IYF) Series, sponsored by iCube. Behind the enchanting moves of each piece that comprised the fall dance concert, is the story of students growing their creative talents and sharing them with the Gibbons community. Registrar Annette Jay will retire in December after 40 years of dedicated service. To celebrate her retirement, we retrace her time at Gibbons and the impact she has had on the school as a faithful servant leader. We continue our Educator Spotlight series, which regularly brings readers inside the classroom of one of our educators. Today, we spotlight Spanish Educator Miguel Casas. The Gibbons school community recently collected 11,129 pounds of goods, providing food and hope to those in need, especially those still recovering from Hurricane Florence and especially during Thanksgiving. Cardinal Gibbons is excited to welcome home former Social Studies Educator Amy Ernenwein who is rejoining our school community as Director of Professional Development. Cardinal Gibbons observed Veterans Day with a special student-led celebration that brought together alumni, educators, and parents who served or are now serving in the armed forces. In Gibbons Drama's high-energy production of The 25th Annual Putnam County Spelling Bee student-actors share their creative gifts and talents. There is something special about being part of a community. That was evident in detail when the Gibbons school community joined together at Junior Mass at Holy Name of Jesus Cathedral. Seven choral students gave up their Saturday recently to share their gifts and talents with middle school students from throughout the Diocese of Raleigh. Engage with us is a phrase repeated often at Gibbons. And that is exactly what was taking place at our recent Open House, which welcomed hundreds of prospective students and families to our school. We continue our Educator Spotlight series, which regularly brings readers inside the classroom of one of our educators. Today, we spotlight Math Educator Leah Iyer '08. Over 20 Gibbons dads recently gathered at The Cardinal Gibbons Short Journey Center for a day of fellowship, service, history, and a little fun. Gibbons students helped cultivate and develop leadership skills in middle school students at the Fifth Annual Middle School Leadership Conference. Some of the most rewarding achievements of Gibbons Athletics are taking place on the field, court and in the gym, as well as in the classroom and community because of the program's culture. We continue our Educator Spotlight series, which regularly brings readers inside the classroom of one of our educators. Today, we spotlight Science Educator Joleen Smith. Sharing the joy of education through service to others - that is the mission of the tutoring program four seniors not only are continuing this year but also are enhancing. In a Gibbons first, nearly 30 alumni who graduated 50 plus years ago, recently gathered for dinner to recall shared memories and pride of being Golden Crusaders. Gibbons welcomed home more than 200 alumni and guests to celebrate their Crusader pride at Homecoming Reunion Weekend 2018. Gibbons Drama's first production of the season is Almost, Maine comprising nine vignettes about the joys and perils of love. Cast members, however, say there is yet another story to tell. For the last 15 plus years, parents, alumni, and friends of Gibbons have joined in fellowship at the links to enjoy time together playing golf and supporting the school. The Cardinal Gibbons chapter of the National Honor Society welcomed its newest members during the recent induction ceremony, featuring Alumnus Josh Teder '11 as the guest speaker. Over 700 educators from Catholic schools across the Diocese of Raleigh recently filled Cardinal Gibbons to share teaching techniques at the Diocesan Education Conference. We continue our Educator Spotlight series, which regularly brings readers inside the classroom of one of our educators. Today, we spotlight Theology Educator Austin Faur. The Short Journey Retreat Center is personally important to many members of the Gibbons school community. Read what some members have to say. Hurricane Florence has left hundreds struggling to recover. The Gibbons community has responded by partnering with Catholic Charities to help those in need. Gibbons is marking the 17th anniversary of 9/11 with reflection and prayer opportunities, including a special display sponsored by the History Club. It is a night of faith, family, and football. It is a time to connect with friends, It is a celebration of the Gibbons spirit. It is Family Football Night '18. Our new Educator Spotlight series regularly will bring readers inside the classroom of one of our educators. We launch the series with English Educator Maria Hill. Parents engaging with parents, educators, and students = Back to School Night, the official welcome to new & returning parents and an opportunity to meet educators. The second annual multi-day Middle School Educator Leadership Conference brought together Gibbons educators and educators from several of the Diocese of Raleigh's Catholic middle schools. The signs are subtle but clear: The initial cleanup is underway at the Cardinal Gibbons Short Journey Retreat Center. The newest members of our Gibbons family, the Class of 2022, recently took the first steps on their journey of service and outreach. In Only at Gibbons tradition, the annual Educator Day of Service is a joyful, energizing day that our educators spend in service to others. In what is an annual Gibbons tradition, the school community came together in faithful prayer during the start of the new school year to celebrate Mass. Freshman Parent Focus 2018 = More than 350 parents caring for parents. Examples of just that and more were on display throughout the recent event. While the phrase, "back to school," may denote the end of summer, her at Cardinal Gibbons it also announces the start of an exciting new academic year. Cardinal Gibbons freshmen started the new school year a day earlier than their schoolmates. It was a most unforgettable day; it was Freshman Welcome Day, an only at Gibbons tradition. New classes, new educators, new opportunities = the transition into high school for students. Before the start of school, 325 incoming freshmen attended Freshman Focus for a preview of life at Cardinal Gibbons. What makes a Gibbons leader? Helping to answer that not-so-simple question is a goal of the annual, three-day Gibbons Leadership Conference. Read More about What Makes a Gibbons Leader? This summer, Cardinal Gibbons welcomed home more than 20 alumni who returned to their alma mater to work with the 1,000 plus students participating in the academics, athletics, and performing arts camps. It may be summer, but Gibbons doesn't take a vacation from serving those in need. Every Monday, members of the school community prepare a hot lunch for over 250 of the area's hungry. The Gibbons school community celebrates Sister Mary Teresita Gresko, SND, who died June 29. Principal of our school from 1972 – 1976, her leadership was a keystone to its success today. These may be the lazy days of summer, but they are the complete opposite for 15 Gibbons students working as interns at area companies. 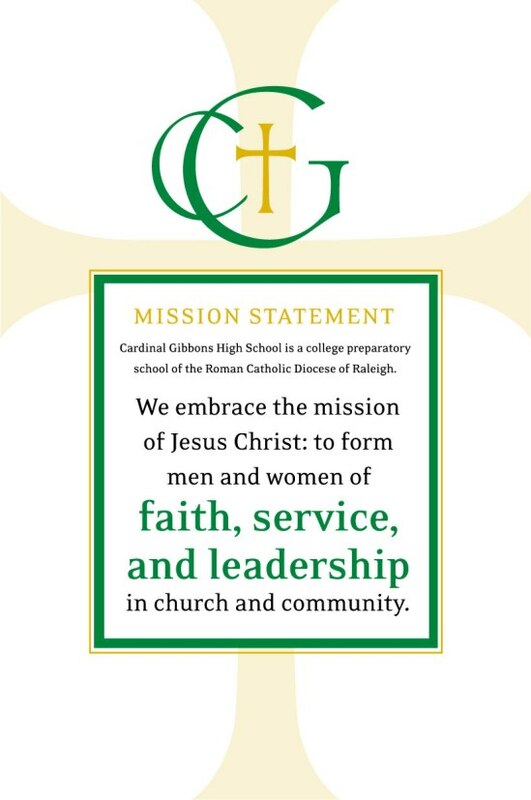 Having a permanent home for its retreats enables Cardinal Gibbons to offer additional formational opportunities to members of its school community to grow stronger in their faith. This summer, Gibbons students, alumni, parents, parents of alumni – and now 6th - 8th graders from area Catholic middle schools are updating the school’s laptops. The Stations of the Cross Prayer Garden, which embodies the faith life at the center of our school community, is undergoing renewal. The history of Short Journey Retreat Center focuses on its legacy as a sacred place that has guided and will guide the spiritual formation of students. For the 385 members of the Cardinal Gibbons Class of 2018 graduation weekend was filled with a historic first and long-standing traditions. Caring and dedicated describe Registrar Annette Jay and Social Studies Educator Taylor Blanton, who were honored for their service to Cardinal Gibbons. In Only at Gibbons fashion, educators made their goodbyes to the Class of 2018 extra special recently by hosting the first-ever Senior Supper. Today, we celebrate Math Educator Dr. John Sprague, who is retiring after 18 years of service to Cardinal Gibbons High School. Today, we celebrate Director of Outreach Agnes Penny, who is retiring after 24 years of dedicated service to Cardinal Gibbons High School. Today, we celebrate Spanish Educator Karen Scharf, who is retiring after 25 years of dedicated service to Cardinal Gibbons High School. Susan Sauls, administrative assistant in the College Counseling Department, is retiring after 30 years of dedicated service to Cardinal Gibbons High School. We celebrate English Educator Catherine Sokash, who is retiring after 35 years of dedicated years of service to Cardinal Gibbons High School. In a first at Cardinal Gibbons, students recently launched a weather balloon from the middle of the piazza, sending it 92,000 feet into the sky. Cardinal Gibbons will swell with more than its usual supply of music, art, and drama as four events take place between today and May 11. The Gibbons community has embraced the school’s recent purchase of the Short Journey Retreat Center, which it will renovate and reopen by 2019. Gibbons recently celebrated Earth Day, joining the worldwide effort to focus attention on environmental issues and inspire ways to protect the planet. With a range of themes, choreography, and dance styles, fused with tradition and innovation, Gibbons Dance Program recently presented its spring concert. Four students earned national honors, placing their art in the top 1% of the thousands submitted to the Scholastic Art and Writing Awards Program. The school’s first-ever Spring Fling aims to showcase the opportunities created by and available to students and to celebrate all things Gibbons. Three Gibbons seniors took the bold step four years ago as freshmen to initiate a tutoring program for children at a local nonprofit. Forty-three Gibbons students and seven educators attended Easter Sunday Mass celebrated by Pope Francis at St. Peter's Square. Students learned about possible internships and careers from 23 Gibbons Alumni and several area businesses at the recent Alumni Career Expo. Cardinal Gibbons purchased Short Journey Retreat Center, underscoring its commitment to the spiritual formation of its school community. The Gibbons community will join together the morning of April 14 in service to others and gather that night for the Spring Social. Going from auditions to opening night, and the countless rehearsals in between, for Pippin is a transformative experience for the students involved in the show. Members of STARs talked about the growth of the program at the 2018 North Carolina Technology in Education Society Conference. Twenty-three Cardinal Gibbons student-artists earned 45 honors in the 2018 Regional Scholastic Art Competition. Theology educator Kim Dandurand is leading a Lenten reflection series, part of the expanding opportunities for spiritual growth Gibbons offers parents. Opportunities for Gibbons parents to serve have grown from a single annual event and gathering to monthly class specific service projects. Twenty-nine Gibbons students and four educators experienced a Western Europe "edventure" on their recent school-sponsored trip. Read More about A Western Europe "Edventure"
Gibbons will launch two bell schedule pilots to assess the best way to respond to our strategic planning initiatives and advance next level learning skills. Ten entrepreneurial-minded students pitched their business ideas to a panel of judges in the first-ever Cardinal Gibbons Pitch Contest. From academics and athletics to the performing arts, Cardinal Gibbons Summer Programs 2018 has something to offer every camper. They gather early every Friday morning, offering prayers of thanksgiving and intentions for the entire school community. They are members of PrayerCRU. From an indoor tailgate and Athletics Hall of Fame reception to two varsity basketball games, it was a Friday Night at Cardinal Gibbons unlike any other. On February 1, Cardinal Gibbons once again welcomed Bishop Zarama to campus - this time to celebrate his first All-School Mass with the Gibbons community. On this seventh and last day of Catholic Schools Week we end our special series with Jennifer Marks who has coached cheerleading at Gibbons for 21 years. On this fifth day of Catholic Schools Week we continue our special series with Social Studies Educator Stephen Ferguson. On this sixth day of Catholic Schools Week we continue our special series with English Educator Jim Ryan. On this fourth day of Catholic Schools Week we continue our special series with Theology Educator Austin Faur. On this third day of Catholic Schools Week we continue our special series with Business Department Chair Darsey Williams. On this second day of Catholic Schools Week we continue our special series with World Language Educator Miguel Casas. We celebrate Catholic Schools Week with a series of essays that spotlights what Gibbons educators learned from their students. We start with Science Educator Angie Melcher. The Student Council sponsored Blood Drive is an annual service project that the Cardinal Gibbons wholeheartedly embraces. Opportunities for Gibbons parents to grow spiritually have expanded, evidenced by the latest addition to the parent faith formation series, Decoding the Book of Revelation. On Saturday, they came, they watched, and they competed at Cardinal Gibbons High School in what could be called the first stop in the World Series of Robotics. Three Cardinal Gibbons High School seniors recently qualified as semifinalists in prestigious scholarship programs at two area colleges. One of the best ways to give thanks is to give back and Cardinal Gibbons Outreach Program makes that a priority every Monday through its work feeding the hungry at The Shepherd's Table Soup Kitchen in downtown Raleigh. They came to share memories, celebrate their alma mater, and enjoy Homecoming Reunion Weekend, Cardinal Gibbons' version of a large family get-together.